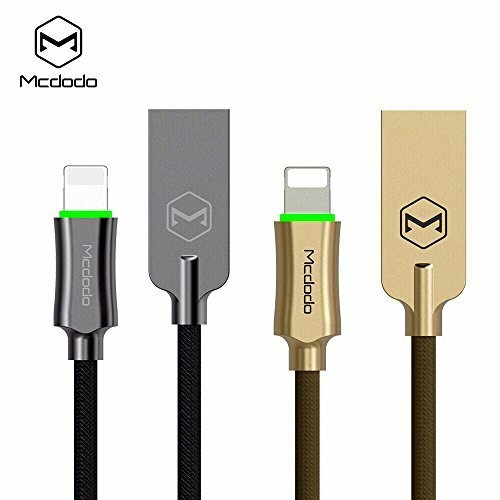 MCDODO Smart LED Auto Disconnect Lightning Data USB Charging Cable for iPhone X, iPhone 8 / 8 plus, iPhone 7 / 7 plus, iPhone 6s iPod / iPad / iPad mini Over-Charging Protection [Auto-Disconnect] This cable is smart and intelligent as it senses the charging level of the connected device and disconnects the device from charging the device gets completely charged. The IC chip in the connector of the cord stops the power supply to the device 20-25 mins after the device gets completely charged, thus protecting the device from problems arising due to over-charge such as heating, decreased battery life and efficiency. The LED light slowly blinking (turns light on and off) when it is charging and the light STOP (totally turn off) when the device is completely charged. Premium Quality Made up of premium quality material. Connectors made up of Zinc Alloy and Copper wire covered with Nylon Braided Jacket for superior durablity and protection of the wire. Faster Charging and Sync Perfect connection with your Apple Devices. High-quality four-core copper wires enhance charging & data transfer speed of the cables. Our technology ensures a faster charging time while keeping your device completely safe. Durable Nylon Fiber Cloth & Copper Wires Nylon Braided Lightning to USB A Cable features high-quality copper wires that maximize signal quality and increase durability. Instead of plastics or Polycarbonate, the cable uses a unique nylon fiber cloth for its protective cover. Wound tightly around the cord, the high-tensile nylon fiber cloth offers superior strength and a bit of flexibility. Even more, the braided nylon is waterproof and can handle daily stress, ensuring long-lasting performance. PERFECT COMPATIBILITY: Smart Auto Disconnect Lightning Cable Compatible with IOS 8/9/10 Apple iPhone 7 / 7 Plus / 6s Plus / 6s / 6 Plus / 6 / SE / 5s / 5c / 5 / iPad Pro / iPad Air / Air 2 / iPad mini / mini 2 / mini 4 / iPad 4th gen / iPod Touch 5th gen / iPod nano 7th gen.9/10 Apple iPhone 7 / 7 Plus / 6s Plus / 6s / 6 Plus / 6 / SE / 5s / 5c / 5 / iPad Pro / iPad Air / Air 2 / iPad mini / mini 2 / mini 4 / iPad 4th gen / iPod Touch 5th gen / iPod nano 7th gen.
2.4A LIGHTNING FAST CHARGE: Reinforced with Aramid Fiber and 3.8mm Wire Diameter Copper Wire Making Nexcable Charging Cable Much Faster and Stronger than Conventional Charging Cables with Thin Power Wire. SUPERIOR DURABILITY: MCDODO Lightning Cable Nylon-braided Cord with Aluminum Casing has a ultra-high 5000+ bend lifespan. Won't Splitting or Breaking Easily. If you have any questions about this product by coan, contact us by completing and submitting the form below. If you are looking for a specif part number, please include it with your message.